Historical fiction is an ever green genre in India. The regional literature with had got into the genre quite early and has established its mark. The classics by the likes of Kalki R Krishnamurthi, Vishvanatha Satyanarayana, KM Munshi have remained all time favourites and some of their works have groomed fan cults. Indian English literature has begun to get into historical fiction quite late and is quite welcome. Gods, Kings and Slaves, The siege of Madurai by Venkatesh Ramakrishnan, a Chennai based historian and author dwells on the conflict between Malik Kafur, the slave and trusted war general of the Delhi Sultan Alauddin Khilji and Veera Pandya, the King of Madurai. Starting with an engrossing narrative of the individual travails of both the characters in their early youth, the book sketches their journey upwards. The reader can be moved by the making of Malik Kafur and inspired by the ambitious Prince Veera. The tale of Malik Kafur that transformed an innocent love lorn youth into a stone hearted manipulative war general who knows no defeat was quite eye opening. The dramatization of Veera’s exploits at a crisp pace makes this book a page turner. The book also dwells into the internal conflicts of the Royal Pandya family. Being the son of a courtesan by the Pandya King, Prince Veera is not considered a natural heir to the throne of Madurai against his step brother Sundara Pandya. But a dramatic turn of events sees Veera ascend the throne but the power comes at a high cost, at the cost of love and friendship. The book alternates between the individual tales of Malik Kafur (I am almost tempted to give his real name away, but that would be a spoiler 😉 and Veera Pandya and I personally found the alternating narrative quite gripping. One highlight of the book with regards to the war scenes was the balance struck between dramatic narrative and attention to detail be it the description of the fortress of Warangal or strategies that made Prince Veera secure a crucial victory at Lanka. A history enthusiast could have his interest rekindled about the many dynasties the author mentions that most of us would not have studied in high school history. His description of Warangal actually made me want to visit the place the very following weekend. (I was in Hyderabad then). The author’s way of handling the after effects of a battle is another noteworthy aspect. One can empathize with Veera Pandya’s broken heart at losing Madurai to invaders and his unspoken grief in seeing the changed layout of the city when he visits the erstwhile Pandya capital in incognito. May be as a poetic justice (oops a spoiler!) all does not go well with Malik Kafur back at Delhi after his victorious conquest of medieval India. The idol of Goddess Meenakshi that he is smitten with which he takes from the temple of Madurai has her own ways of working. The mystique touch at the end of the novel was the lone thing which I felt was out of sync with the rest of the book which does not have a super natural angle. (It might be just me). But then with Kings and Slaves dominating the story, the gods had to show themselves sometime and it happens in the last few pages. The book ends with a brief epilogue about Kumara Kampana, the Vijaya Nagara Prince reclaiming Madurai. I personally liked the strong female characters along the novel, be it Tara, Sunanda, Radhika or Vani. Readers could wonder about who the male protagonist of the book is when it alternates between the stories of Veera and Kafur. But each of the women make it clear to the reader that they are all here as heroines of their own mettle. In the authors note, we get to know that ‘Madura Vijayam’ a 14th Century work written by Queen Gangamba was the inspiration for the book. Or rather the book might work as a sequel to the events described in Madura Vijayam. As a history lover I hope that R Venketesh does take to writing the sequel of reclaiming Madurai too. Venketesh is a bilingual author and has penned Kaviri Maithan, the Tamizh sequel to Kalki R Krishnamurthi’s block buster classic, Ponniyin Selvan. 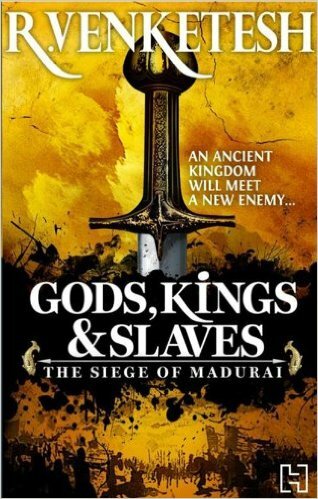 Gods, Kings and Slaves – The siege of Madurai happens to be his first novel in English. The novel did reignite my enthusiasm for the medieval Indian history, especially that of South India and got me reading about the rise and fall of many kingdoms and dynasties that my school curriculum had by passed. If you are a history lover, then go for it on Amazon.